Keep this heart-wrenching story in mind as you ponder just why our US foreign policy is on the side of the Muslim Brotherhood in Egypt. The mother had not seen her daughter for two years after the girl’s father abducted her without warning and took her to Egypt. A British mother whose daughter was abducted and taken to Egypt by her Egyptian father rescued the toddler after disguising herself with a burka and snatching the young girl off the street. Alex Abou-El-Ella, who had not seen her three-year old daughter Mona for two years, received help from British author Donya Al-Nahi, who has been nicknamed “Jane Bond” for masterminding countless “operations” to rescue children snatched by Arab fathers. The abduction by Mona’s father came without warning. Two years ago, Mr. Abou-El-Ella told his wife he was going to visit friends in Hounslow, a short distance from Heathrow airport, and took Mona with him. Instead, he went to the airport, bought tickets to Cairo on EgyptAir and boarded the plane without a passport for Mona. Police, the Serious Organized Crime Agency and Interpol were all put on red alert when Mona disappeared, but no one had been able to retrieve Mona. During the two years, Alex had intermittent phone contact with her daughter, with her husband periodically threatening to cut off it off altogether. She was told by police that there was nothing could be done since the UK has no extradition treaty with Egypt. Despite warnings by the Foreign Office not to travel to Egypt, Alex decided to embark on a daring rescue attempt herself. Together with Al-Nahi, Alex flew to Egypt and found the apartment where Mona was living with relatives. The next day they spotted Mona walking near the apartment with an aunt. The two hired a trusted driver. 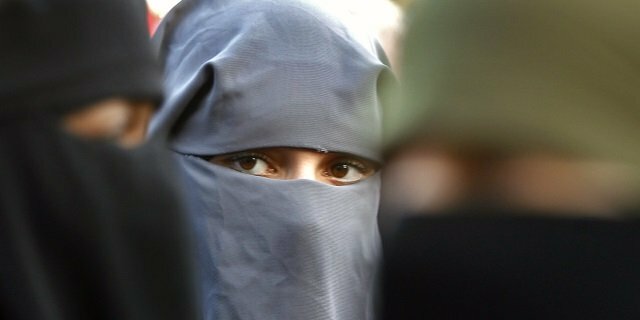 Alex, disguised herself by wearing a burka, with her face hidden by a black veil. The plan almost failed when Alex stumbled on the unfamiliar amount of long material she was wearing. Eventually, Al-Nahi helped her into the getaway car and they sped to the airport. Alex, who was born in Poland, used a passport that belonged to her older daughter (in addition to bribing an official) and boarded a flight back to England without being detected. “She finally recognized me and it was a beautiful moment for me, especially after not having her for the past two years,” she said. After reading it you can only question why the heck US policy continually appeases radical Islam and remember Major Nadal Hissan’s workplace violence, Benghazi caused by a YouTube video, and the fact the NYPD & FBI training manuals have been cleansed of any mention of terrorism or radical Islam thanks to CAIR. This entry was posted on Thursday, August 8th, 2013 at 2:50 pm and is filed under Islam- the religion of peace, Updates. You can follow any responses to this entry through the RSS 2.0 feed. Both comments and pings are currently closed.